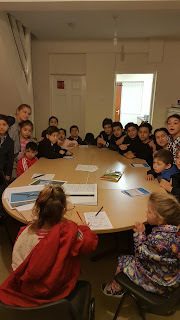 On 19th of January we organized in Cullen Street a workshop to introduce for the Roma kids the thematic of recycling. We had a storyteller about Albie the albatross. Was a story with tragically end but the children understand that they can change the story end only if they know how to recycling. We spoke with them about the importance of their role in the community and how a little thing can change the environment and the future of living beings. We were pleased to see that we have in the group, children that they have some information about the recycling. Alice 8 years old is our first Recycling Hero from the Roma Community.